A native of Daytona Beach, Natalie Henderson (@killingmoon82 on Instagram) managed to make her way to Memphis, Tennessee. In spite of growing up to some seriously good inshore and freshwater reeling, fishing was not huge thing for Natalie when she was growing up. A couple years ago, though, Natalie caught “freshwater fever” when her friend Chris took her out on Glen Springs Lake and she landed her first catfish. Ever since, the busy mother of two hasn’t looked back. Now, she not only fishes whenever she can, but Natalie is also a pro for The Slough Life. One of the reasons that Natalie agreed to join their staff is because she uses and really like their products. Natalie really appreciates the skill and craftsmanship that The Slough Life puts into their gear. In spite of how busy Natalie can get, the ophthalmic assistant to get out on the water and fish. But she has an interesting problem. In spite of her freshwater fever, Natalie still does plenty of saltwater fishing, like when she visits her hometown. But this has created problems in its own right. Although, her son is currently less-than-enthusiastic about freshwater fishing, Natalie still manages to find time on the water. But, in truth, Natalie really prefers to fish alone. 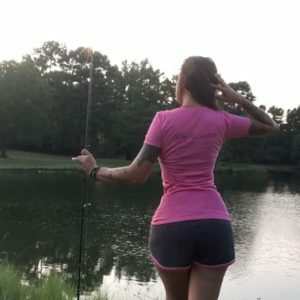 “Fishing is how I get my alone time,” she says. And for Natalie, it’s about much more than catching the fish — bass or otherwise.